Brander Castle recounts his family's harrowing inner-tubing. It's been two summers since 12-year-old Brooklynn Castle went tubing. That time, she says, she almost died. Her whole family set out on one of those guided rafting trips. They rented tubes, got a short spiel from the guide, and then set off onto the Spokane River. The tubes were the wrong size for their body types. They kept tipping over. They weren't remotely prepared. 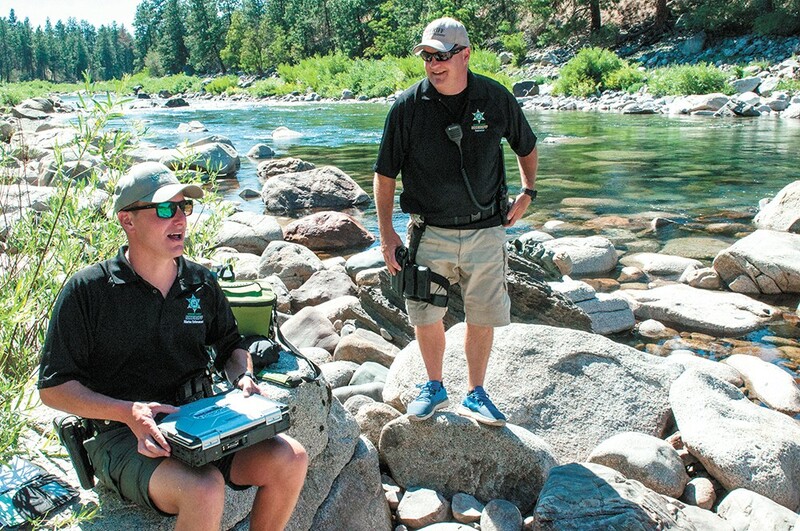 "The guides basically just did a five-point, three-minute conversation on 'this is what these things are called,'" Brooklynn's dad, Brander, says. "We didn't feel like we got educated about how to survive the trip." And for Brooklynn, the most intense moment was between the Peaceful Valley neighborhood and T.J. Meenach Bridge. She tips over in a spot that — despite her life jacket — plunges her underneath the rapids. And then, a second later, a hero comes to her rescue: Her older brother jumps off his own tube to save her and brings her to safety. "He saved my life," Brooklynn says, laughing with the intensity of it all. "He grabbed me. It was awesome." It's the sort of thing that, for some people, would put them off tubing ever again. "We all almost drowned," Brooklynn's mom, Jami, says. But the Castle family won't be dissuaded, they say on a recent Sunday on the banks of the river near Upriver Dam. They're about to scout out another rafting trip. Brander's been doing a lot of research online about how to handle tipping over in rapids. Look downstream so the current doesn't push your face in. Float on your back. Keep calm. Of course, planning can only take you so far: Brander's wearing a T-shirt with that famous Mike Tyson quote: "Everyone has a plan until they get punched in the mouth." But risk is half the fun. When Brooklynn talks about her near-death experience, she doesn't use the vocabulary of fear or trauma. She uses the vocabulary of adrenaline. Spokane County Sheriff deputies Brad Humphrey and Jim Ebel conduct life-jacket emphasis patrols on the river last month. It's a hot Sunday afternoon as five inner-tubers lug their equipment up from the Spokane River and past the Centennial Trail. They don't look happy. This Spokane Valley apartment complex was not their intended destination. They're clad in bikinis and boardshorts and late-summer tans — but no life jackets. And that, it turns out, was the problem. The crew floated right into the path of two Spokane County sheriff's deputies in the midst of life-jacket emphasis patrols. Deputy Jim Ebel, head of the Spokane County Sheriff Marine Enforcement Unit, stands at a rock on the shore, gazing out at the water. An osprey flaps overhead and lands on a branch of a towering evergreen on the other side. Deputy Brad Humphrey sits nearby, with a heavy duty police computer on his lap. In Spokane County rafting without a life jacket will get you either a civil infraction — a $76 ticket — or a misdemeanor charge that results in an arrest. It's up to Ebel's discretion. In his five years on the marine unit, he's only recovered one dead body that was wearing a life jacket. "They work when you wear them," Ebel says. "That's a good quote." Just having a life jacket on the raft beside you, Humphrey adds, is a little bit like having your helmet on the back of your motorcycle. Not very helpful when you crash. Most of the main entrances to the river have signs reminding rafters and tubers that life jackets are required. At least, they're supposed to. "About every week I check them and someone has taken them and thrown them in the river or something," Ebel says. Apparently, not everyone likes the message. But all the ticket writing and signs and educational programs have been working. The deputies have seen 100 rafters glide by on this sweltering Sunday afternoon in July, and the vast majority have been wearing life jackets. A few years ago, few rafters bothered. "You'd sit here and write 100 tickets a day," Ebel says. Today, their ticket writing tally is usually down to single digits. And, indeed, as another flotilla of floaters glides past, they're all in compliance. One paddle boarder, Jake Bohn, explains that the woman in front him told him he couldn't get in if he didn't have one. The line soars across the Falls Park fishing pond with vwiiippp. Not bad for a 10-year-old newbie. "First time they've been fishin'. Ever," Jim Bennett says about his granddaughters Rian Gutterud and 6-year-old Parker. "Got them some Zebco reels." Like Riverfront Park, Falls Park in Post Falls turns a stretch of the Spokane River into a wonderland: If Riverfront Park is the gem of Spokane, Falls Park is the gem of Post Falls: osprey nests, raging waterfalls, hydroelectric dams, tranquil ponds filled with ducks and — supposedly — fish. The pond is stocked with hundreds of trout every year — though the water is likely too hot for the trout right now. But that hasn't stopped this crew from trying. "I've almost caught some of them, but when I try to reel them in, they let go," Rian says. Maybe the bait is the problem. Bennett turns around a little canister filled with a rubbery pink substance. PowerBait. But, apparently, the wrong kind. "This other guy says I need rainbow PowerBait here. I don't know the difference," Bennett says. "He said garlic PowerBait really works." But for the kids, with every cast there's still hope. Rian reels in her line and takes a hold of her latest catch in front of her eyes. Jule Schultz, with the Spokane Riverkeeper, organizes interns during a cleanup effort. Jule Schultz has found a lot of stuff in the Spokane River. Weird stuff: wagon wheels, solid rubber tires, an old metal boiler used for heating. When the river was commonly used as a dump, people would throw all kinds of things in it without so much as a second thought. Pollution in the Spokane River can pile up, and it's part of Schultz's job to make sure it stays at a minimum. On a hot afternoon in Peaceful Valley, he prepares to take a handful of college interns onto the river for a tour and some light garbage cleanup. 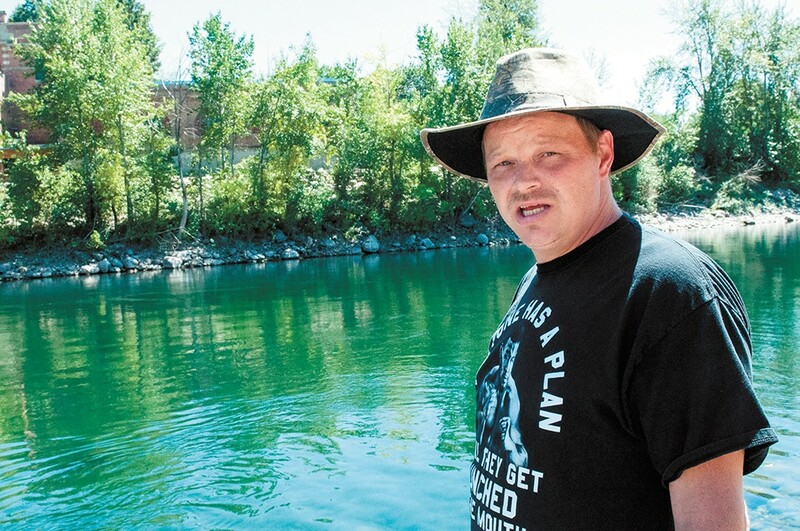 He leads similar groups with volunteers, travelling downstream, using grabbers to collect trash on the riverbank for the Spokane Riverkeeper's office, where he works. A couple weeks back, he hauled 400 pounds of trash out: "Just a massive pull," he says. "A lot of these garbage issues are essentially massive piles of clothes and sleeping bags that get brought down to the river and left there and the only way to get it out is by raft — or by a flood," he says. Homeless camps are one of the sources of the problem, but he says the Riverkeeper's outreach interactions with those communities are generally positive. 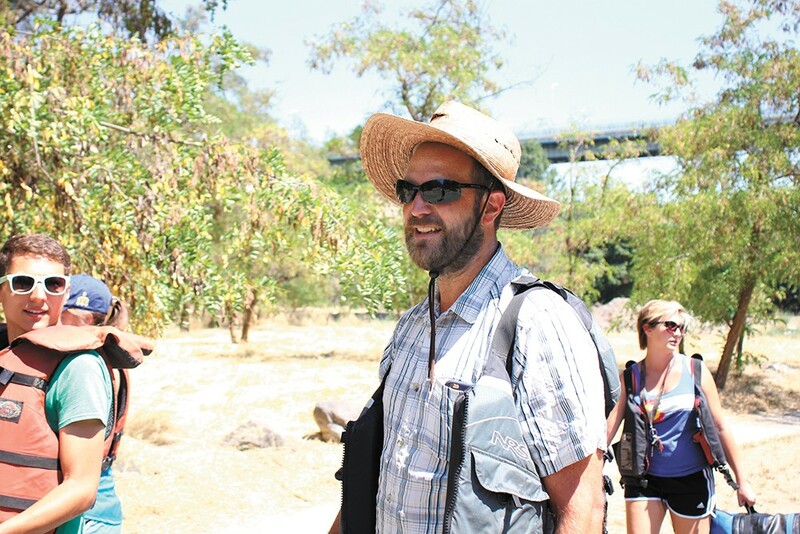 Schultz has worked with the Spokane Riverkeeper's office for the last four years as a field scientist. In addition to the cleanups and outreach, he also analyzes the river's characteristics, such as its ecology and natural history. Darren Young controls the Spokane River the same way you might control the water faucets in your home. His job is more complicated than that, and the consequences are overwhelmingly bigger, but it's essentially true. From a suspension bridge over the river in downtown Spokane, he overlooks his domain. As Avista's chief journeyman operator for the downtown area, Young is responsible for how much water is flowing through the river downtown. He controls this from inside the dimly lit, low-ceiling, concrete interior of the Upper Falls plant, managing everything from energy generation, to recreational and aesthetic water flow, to flood control. "The mountains is where my job starts," he says. "I keep track of snowpack, river-flows up stream, the lake level. I keep track of what water is being passed at Post Falls in the Upriver Dam, because it all affects me here. "This time of year I would get just over 10 megawatts of electricity between [Upper Falls and Post Street]. I need about 18 to run downtown on any given day." It's a hot day, late in the afternoon near Spokane's Chief Garry Park Neighborhood. There are makeshift campgrounds scattered along the riverbank, just a stone's throw from the brand new Riverview Lofts apartment complex, still partially under construction. A couple carrying a giant plastic bag filled with laundry march along South Riverton Avenue to a clearing in the bushes that leads to an overgrown trail along the Spokane River. They don't respond when approached. Along the trail, signs of human activity are relatively sparse at first: cigarette butts, a couple sun-bleached cans and other forgotten trash. But look closer around the trail, and it becomes obvious that the area is a well established camp. There's a blanket stuffed in between a tree's branches. A sock here. Two socks there. There's garbage, too, but the riverbank is relatively clean. The water is clean, clear and still. The heat, reaching 90 degrees, is blocked by a thick layer of bushes and trees. Some of the lean-tos and tents almost blend in with the natural surroundings. A few teenagers with fishing poles and a dog walk down the trail. A construction worker from the nearby apartment complex bounds down to the riverbank to pee. The original print version of this article was headlined "Teeming with Life"